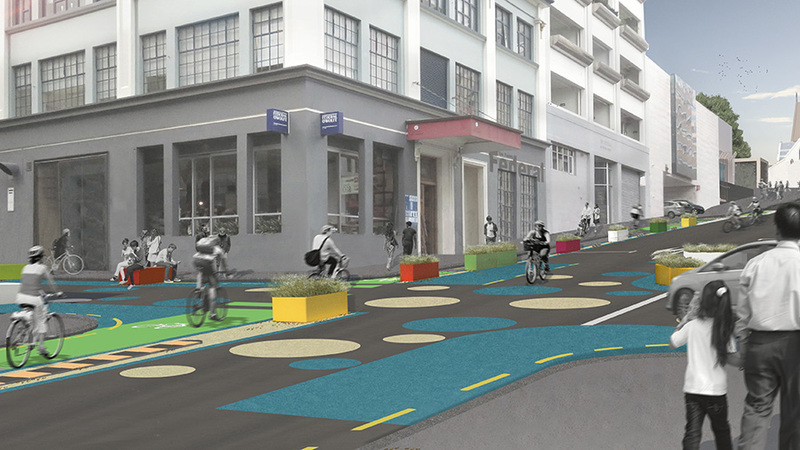 Last year Auckland Transport consulted on creating a shared space at the southern end of Federal St. At the time they said investigation on the section between Victoria and Wyndham streets would begin this year. There was no timing given for the final section from Swanson to Fanshawe streets. As a welcome surprise, on Friday AT revealed they’re going to be making a series of quick and cheap tactical urbanism style improvements to both of those two final sections. The key changes involve adding a ‘contra-flow’ protected cycle lane, improved footpath surfacing, some footpath buildouts, painted road markings and they’re looking at a pedestrian crossing for Wyndham St. The painted road markings are a series of different sized and coloured polka dots at the various intersections along each section, similar to what they’ve done on Shortland St. There are a lot of good, small improvements and because they’re all quick changes, it’s all expected to be completed by the end of March. Furthermore, because the changes are relatively cheap and easy to change, AT are going to build it first then consult on how people feel about them and make changes as appropriate. Consultation is expected during April and May. Below is what is planned for each section. It’s great to see AT finally taking more of a tactical urbanism approach and hopefully, if successful it’s something they can roll out to more projects. Have AT got ‘generational change’ as well as Labour and National? It would be nice if Auckland Transport could do something about Federal Street between Victoria Street West and Wellesley Street West. Having spent $12m on turning it into a “shared space”, the only sharing seems to be between buses and taxis. It is a thoroughly unpleasant space to be on. AT should have a parking officer permanently stationed at Federal Street for 3 weeks and a tow truck waiting on Wellesley Street. Even better would be a stationary camera so that someone can sit in an air conditioned office and dole out tickets without risk of assault from motorists. The solution would pay for itself and fix the problem fairly quickly. That’s good. Show, don’t tell. While I quite like the spots and stuff, what is the legal basis for street crossings without formally approved zebra crossings and Belisha beacons (orange flashing globes) etc? I ask merely because a colleague pointed out to me that only a full Zebra crossing has a legal status under the law as a place to cross the road – and therefore for cars to slow down and give way etc. The current trend of having raised platforms with coloured paving and rumble strips etc seems to work well at confusing the driver and making them drive a little slower, but apparently has no legal status. If someone gets run over on the dots and spots, who is liable? I imagine as long as the driver is doing under 50 km/hr (supposedly a sensible speed in a central city), the pedestrian is at fault and will be sued by the driver’s insurance company. Yes. And to get a driving licence, our young folk have to make sure they can go that fast — if they drive more than 5 km/hr less than the speed limit, they’ll fail the test. We wonder why we’re a nation of arrogant drivers? Legally a pedestrian can cross the road anywhere the like (except within 20m of a formal pedestrian crossing), and technically a driver turning into a road should stop and give way to anyone already using the road (i.e. a ped part way through crossing it). However a formal pedestrian crossing is where drivers are required to stop for a pedestrian *waiting* to cross the road. The spots are the same as any other piece of street. A pedestrian can cross the road, they should not cross if a vehicle is already driving on it, but equally a vehicle should stop if it enters the road where a pedestrian is already crossing (in theory!). If someone gets run over on the dots, the liability is the same as if the dots weren’t there. Do you have a source for motorists being required to give way when they turn onto a road? “To legally and safely make a left or right turn: do a thorough check for other vehicles … check over your shoulders … watch for pedestrians… turn when safe” I think that probably covers it. “Shared zone: This is a road that has been designed to slow traffic and give priority to pedestrians. Drivers give way to pedestrians who, in turn, should not impede traffic.” Question is, is it always clear to users whether the space is a shared zone or not? Yes that basically it, the de jure nature of pedestrians as road users mean they technically have right of way in various situations where the de facto rules of “peds always give way to cars’ tend to overrule in practice. Legally you can walk down the middle of a traffic lane and as long as you obey all the road rules everyone else should treat you as if you were in a car… but I wouldn’t recommend exercising those rights! I think you have to be careful taking as gospel what the Road Code says; it is a simplified interpretation of the actual legislation (Land Trpt Act, Road User Rule, Traffic Control Devices Rule, etc), plus some general “good advice”, and doesn’t always record all the nuances of these rules (esp. where peds and cyclists are concerned). E.g. “Turning traffic gives way to traffic that is not turning” – pedestrians are not “traffic” (i.e. vehicles) so there is no default giving way, except where there is a signalised crosswalk or zebra crossing. There is some work to rectify that difference in our pedestrian legislation, but it doesn’t currently exist for all scenarios. Having said, irrespective of the law, good DESIGN can go a long towards implementing what you intend, e.g. raised coloured platforms are a very effective tool because they slow down motorists and introduce some uncertainty in them. From a safe system perspective, that greatly reduces the risk of death or serious injury. P.S: there is no legal concept of “right of way” in our traffic legislation; you may have to give way to other parties and you may have PRECEDENCE over other parties, but no-one has absolute right of way. E.g. emergency vehicles may trump your right to go first (but even they have to check that the way is clear). This also means that you cannot just wilfully run someone over because they should have given way to you; all drivers still have a duty of care to others. A left turning driver must give way(but never do). A driver heading straight can just run peds/ cyclists/dogs over till his heart’s content. They were crossing heedless of traffic and failed to give way! That is why older cars have a hood ornament. It is a sight to line up pedestrians. If a road controlling authority – in this case legally deemed as Auckland City Council – alters the status of a road way to that of a ‘shared use zone’, then the rules around said road, change to priority being given to pedestrians over and above motorists. Any part of said road, the rule know says motorists must yield in every instance to a pedestrians, however pedestrian activities must not interfere unduly with the motorist making their way through this zone. As long as the motorist does not exceed 10km/hr and they give way to any pedestrians. Yes this does mean if a pedestrian is walking in front of the car in the same direction, the motorist must wait just as if on a normal street in a queue of slow traffic. I hope that there’s something in the plan to slow down the cars exiting the ANZ bunker – most seem to ignore the fact that they’re crossing a footpath. Love all of this, especially kerb buildouts at Fanshawe Street, that intersection is horrible on foot. Hopefully AT can also realign that zebra crossing of Wyndham to the desire line. Rather than dots I would prefer to see random curvilinear patterns like camouflage paint in dark green, brown and black. It would look more tactical. perhaps to really camouflage it, there should be a medley of denim-coloured leg-shaped stripes on the roadway….? Doesn’t that come after it goes operational…? /tongue in cheek. Great to see more of this approach. More again please. What a fantastic idea. Looking forward to seeing how pedestrian movement is improved at those busy intersections. Well done AT. Very cool, connecting the isolated square of Saint Patrick to the imperfect but not bad Skycity courtyard and through to the under construction upper part (perhaps to be renamed Saint Matthew’s patio if we want to treat all churches fairly) will make a gentle stroll or cycle from Food Alley to Aotea an absolute pleasure, and make catching a train into Britomart to go to the Civic a much more reasonable option. With my young family living nearby this is quite exciting! Forecourt like a petrol station has a forecourt? I second that, courtyard implies that you could safely pedestrianise, which does not express the reality of this block. Those dots are awful. They may look great on Day 1, but several weeks later they look worn out and terrible. The on road shared cycling in the traffic travel direction may need some additional traffic calming to keep the vehicle speeds down to 20-30kmh. The links are short but it may well still be possible to exceed that speed. The next candidates would be Durham st West/lane as well as Mills lane. Those laneways are currently uninviting for people to walk in. If council upgrade those laneways, they will eventually attract a lot of bars and restaurants like Melbourne. Council can collect more rate and tax from the initial investment. It would be a win win win for council, general public, and businesses. High street may face resistance from last century thinking business owners. Much better news, I have thought for some time that shared paths was a waste of money, the area doesn’t lend itself to having café’s due to the positioning of the buildings (sides & backs). The area is in need of upgrading and it’s great that the area is going to be improved soon. Although there is a bar and cafe already operating in the lower part of Federal, so one shouldn’t preclude anything. I agree with your shared path sentiment, especially with electric bikes set to increase, they will start to imitate those awful bus / bike lanes that are being phased out. Shared paths need to die. Worth using only in remote parks and on semi-urban / rural routes (low pedestrian number). The coming ATCOP replacement guidelines will thankfully discourage shared paths more I hear – but I worry that they will still crop up too much. Especially some urban designers in Council and Design Office and Parks seem to worry that using protected bikeways are bad for pedestrians and place feel (!) and take too much space, so are championing shared paths – see Wynyard Quarter. It’s tiring having to battle the same thing over and over instead of having good design decisions followed by all involved. The coming ATCOP replacement guidelines will thankfully discourage shared paths more I hear – but I worry that they will still crop up too much. Especially some urban designers in Council and Design Office and Parks seem to worry that using protected bikewsys are bad for pedestrians and place feel (!) so are championing shared paths – see Wynyard Quarter.